This Cinnamon Roll Recipe is about to change the way you make cinnamon rolls forever! Soft, fluffy and super EASY - they are seriously the best homemade cinnamon rolls in the world! Select dough cycle & press START. When your dough cycle is done (mine takes about 90 minutes) pull the dough out and place it on a lightly floured surface. Cover with a towel and let it sit for 10 minutes. Meanwhile, combine brown sugar and cinnamon for the filling in a small bowl. Roll the dough into a 16x21-inch rectangle. Spread 1/3 cup butter on top and sprinkle evenly with sugar/cinnamon mixture. Roll up dough and cut into 1 inch rolls. Place the cinnamon rolls in a lightly greased 9x13 inch baking pan. Cover with plastic wrap and let them rise for about 30 minutes or until nearly doubled. Bake the cinnamon rolls in a preheated oven until golden brown, about 15 minutes. While rolls are baking, beat together cream cheese, 1/4 cup butter, powdered sugar, vanilla extract and salt. 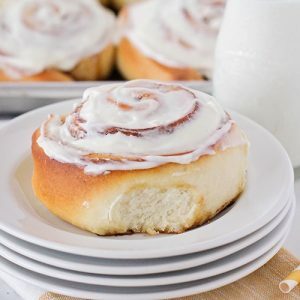 Spread frosting onto warm cinnamon rolls before serving.